The aerospace giant's main customer is the U.S. government. Its high debt stems largely from the acquisition of aircraft manufacturer Sikorsky. If you're an investor in Lockheed Martin (LMT - Get Report) , it would be natural to get spooked. The near 100% jump in the debt levels of Lockheed Martin last quarter is certainly disquieting, particularly for conservative investors. Yet the world's largest defense company boasts of the U.S. government as its biggest client and has a strong line-up of products. It represents a solid, safe investment opportunity. Healthy operating cash flows, bright earnings prospects and a growing dividend yield makes the stock a bankable proposition, even though it's trading near record highs. Lockheed Martin has the potential to scale higher and to be among the market-beating growth stocks of 2016. Lockheed has a huge and profitable product portfolio. The best part about the company is its close relationship with the U.S. government. Lockheed Martin also counts several foreign governments looking for cutting-edge defense equipment as clients. The main weight on Lockheed Martin's shoulders, leading to the debt pile build-up, is its $9 billion acquisition of aircraft manufacturer Sikorsky. Instead of debt, consider the solid free cash flow to debt numbers. With an FCF of $4.1 billion and a debt of $15.26 billion, Lockheed Martin scores an FCF/debt ratio of 0.27, implying that it could pay off all its debt in less than four years. Sikorsy is a shrewd asset acquisition and will help the company grow bigger and better. Also, for those still bothered about its debt, glance through Lockheed's Interest Coverage (IC) and the industry average. Lockheed may look a little off when compared to Boeing (27), but at 12.3 for IC ratio it's in a far better place than United Technologies, Airbus Group, Northrop Grumman and Finmeccanica. Even after a loaded debt scenario, Lockheed offers a relatively safer margin in the event of future and perhaps unforeseeable financial adversities. You see Jim Cramer on TV. Now, see where he invests his money and why Lockheed Martin stock is a core holding of his multimillion-dollar portfolio. Want to be alerted before Jim Cramer buys or sells LMT? Learn more now. Lockheed Martin operates in an industry with high barriers to entry due to the complex nature of its products. Investors considering Lockheed expensive must also consider the following factors before they jump to a hasty conclusion. The five-year, expected price-to-earnings-to growth ratio 2.27 for Lockheed is slightly better than Northrop Grumman (2.49) and is in line with Raytheon (2.02). While Lockheed seems more expensive than Boeing, the former is more profitable (Lockheed has a 7.81% profit margin vs. Boeing at 5.39%). On a price-to-cash flow basis, Lockheed at 13.8 times is trading at a big discount to its five-year average of 16.2. Free cash flow -- a far better indicator than profits -- has been steady at $3 billion-$4 billion a year for Lockheed. 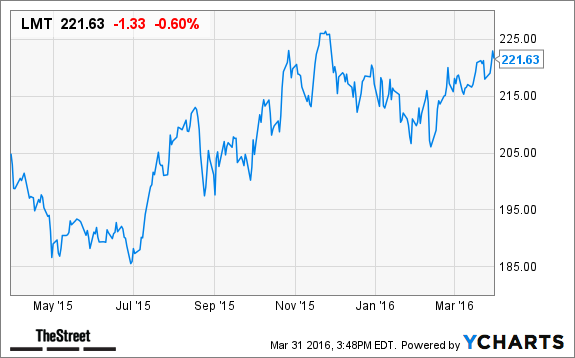 Lockheed is also a solid dividend stock. At 55.5% dividend payout and 13 years of dividend growth, Lockheed Martin has been shareholder friendly and has rewarded shareholders. The stock's nearly 100% rise in dividends helped Lockheed beat aerospace and defense stocks as well as the S&P 500 every year for the last half a decade. This trend should continue to move forward even as the Sikorsky acquisition starts bearing fruit. With earnings projected to go up by 8.23% per annum for the next five years, Lockheed is a stable and growing investment at this time. Combined with its dividends, Lockheed Martin, even with its debt, could generate 15%-20% total returns in the days ahead. 85% Accurate Trader gives his Personal Guarantee. He turned $50,000 into $5 million trading this way and for a limited time, he's guaranteeing you at least $67,548 per year in profitable trades if you follow this simple step-by-step process. Click here to see how easy it is to collect thousands of dollars in "Free Money" every month.